John F. Kennedy International Airport opened in 1948, after the realization set in that the newly built LaGuardia Airport was unable to handle the volume of air traffic for New York City. Pushed through by New York's Mayor Fiorello LaGuardia, the airport was to be located 14 miles from Manhattan, in Jamaica Bay, Queens, on the site of the old Idlewild Golf Course. For its first years, Idlewild Airport, as it was originally known, consisted of a low-budget temporary terminal and a series of Quonset huts. A major new building program began in the mid-1950s, and the airport rapidly changed from a ramshackle series of buildings into a glamorous-looking city. 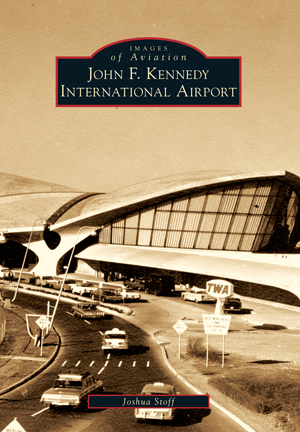 Renamed John F. Kennedy International Airport in 1963, it has now grown to cover 5,000 acres. Joshua Stoff, noted aviation historian and author, is the curator of the Cradle of Aviation Museum. Many of these photographs have come from the extensive archives of the museum, as well as the once magnificent archives of the Port Authority of New York and New Jersey, which were sadly lost in the attacks of September 11, 2001. Fortunately, these representative photographs, many of which have never before been published, were copied prior to those attacks and were saved.